Enterprise IT is changing. It’s evolving from a rigid, static, manually configured and managed architecture to one where connectivity is dynamic, application services are on demand, and processes are automated. Enterprise networking is evolving along with IT. This has been evident in the past several years in initiatives such as enterprise digitization and as-a-service consumption models, as well as their enablers, including BYOD, IoT and cloud. Add to this, all of the security implications of each initiative. The evolution of IT requires a network that evolves along with IT’s changing requirements – a network that continuously adapts to ever-changing security threats, and evolving digitization, mobility, IoT and cloud requirements. 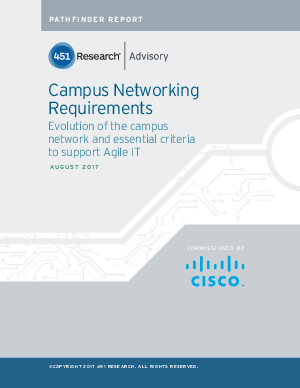 The purpose of this paper is to assess the switching requirements for next-generation campus networks incorporating wired switches, wireless LANs and WAN routers in an intuitive, intent-based network supporting cloud, mobility, IoT and digitization, with pervasive security.